TINA is an international art platform. We are currently looking for worldwide curators to be included in our team. an international platform who allows artists to get in contact with a net of galleries and curators always interested in evaluating new projects. TINA now includes a net of galleries in Barcelona, Berlin and Rome. Artists from all over the world will have the opportunity to submit their research to our team and be awarded with the realization of their own exhibition. TINA WILL open its call for artists on July 2014. In the meantime we are developing our curatorial board. Our curators will be part of a stimulating and purposeful network, which will be expanded year after year. Curators will work in the process of inviting and selecting artists for the exhibition of Barcelona, Berlin and Rome and will have the opportunity to grow up with us. WHO are we looking for? Curators seriously interested in having contacts with new artists and evaluate their works. Curators can be any age and live anywhere. They will be selected according to their CV of studies, pubblications and curatorial projects. It is indispensable to have a base of curatorial practise and some experiences of direct dialogue with artists. to apply? By sending your CV and a brief letter of just few lines explaining your curatorial view at info@tinaprize.com. Applications should be sent within June 30th, 2014. 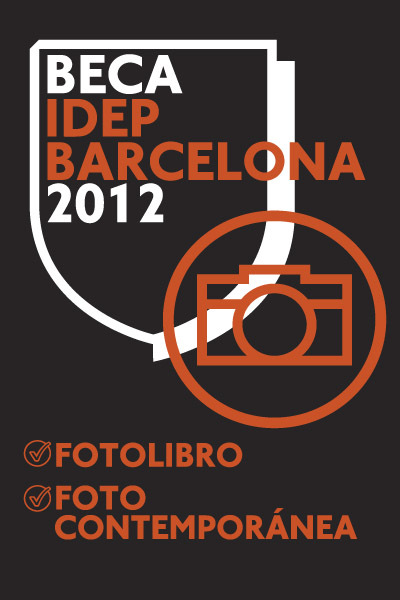 This scholarship is for a postgraduate course in photography, in Barcelona. The course will be held in Spanish, so sending your materials makes only sense if you already understand this language. This is also why I will not translate the text below, but I do urge you to send it to any interested Spanish-speaking photographer who wants to enter the art field, with this program, called Creación Contemporánea. exposición, presentación online o intervención del espacio público. gestión, producción y difusión de la obra artística. pueda desarrollar, modificar, redefinir o debatir con los docentes y tutores. que tengan formalizada la matrícula. 4. La beca no incluye las tasas universitarias (450€). 5. En el caso de que el jurado así lo considere, la beca se declarará desierta. también la anulación de la beca. 7. La beca es exclusiva para realizarse en el año académico 2012/2013. 9. El plazo para participar termina el 23 de septiembre de 2012. Contemporánea: excelencia, enfoque del autor, tema y viabilidad.  Cómo puede el proyecto contribuir al aprendizaje de los demás alumnos del postgrado.  Currículum del concursante (formación, exposiciones, proyectos anteriores…).  Carta de intención e interés. Coordinadora de Idep Foto (maite@idep.es). 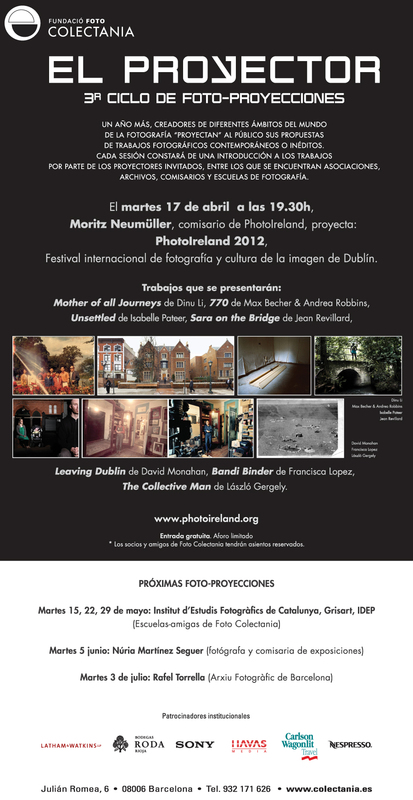 The prestigious Foundation Fotocolectania in Barcelona will host a projection of some of the authors of the 2012 edition of PhotoIreland, in the framework of their program El Proyector. Featured projects are Dinu Li’s Mother of All Journeys, Max Becher’s & Andrea Robbins’ 770, David Monahan’s, Leaving Dublin, Isabelle Pateer’s series Unsettled and Jean Revillard’s Sara on the Bridge, as well as the book dummies of Francisca Lopez’ Bandi Binder project & Gergely Laszlo’s Collective Man.